For many years it was thought that Prince Rupert was the discoverer of mezzotint. Publications from the time mention only the Prince as working in the mezzotint method and it was assumed that he initiated the technique. Prince Rupert made many contributions to the technique of mezzotint. He used the same tools as von Siegen but in a more deductive manner. He grounded larger areas with the roulettes and then used his burnishers and scrapers extensively to create the image. As a man of science Prince Rupert experimented with the technique and also with producing new tools for creating denser and more even textures. At this time other artists also began to use the new technique of mezzotint. In 1656 Theodore Casper von Furstenberg experimented with mezzotint and in 1658 Flemish painter Jan Thomas of Ypres. Also around this time Wallerant Vaillant a French painter and etcher was hired by Prince Rupert to assist with his engravings and probably contributed to the process of developing and refining the mezzotint rocker. Later, in 1662 Vaillant moved to Amsterdam and became a successful mezzotint engraver and publisher helping establish and contributing to a healthy community of Dutch mezzotint engravers later known as the Dutch School of Mezzotint. This group included Abraham Blooteling who was born in Amsterdam around 1634. Blooteling was a successful line engraver who began making mezzotints after contact with Baron von Furstenberg and probably Wallerant Vaillant. In 1672 or 1673 Blooteling arrived in England after escaping from the turmoil in Holland created by invading French troops. Shortly afterward he began producing mezzotints with far superior and refined tonal gradations. This has been attributed to his contact with Prince Rupert in England and their development of what came to be known as the modern mezzotint rocker. A new improved rocker and new, more thorough grounding techniques greatly improved mezzotint quality. The new tools and techniques allowed artists to work totally deductively on well grounded plates. These developments in turn separated the grounding process from the creative process and the time consuming grounding could be left to assistants. The modern mezzotint was finally born and its advantages were evident. Corrections were easier to make and worn plates could be reworked. Images could now be rendered with form, texture and light and exact likenesses could be achieved with continuous tone. As Ludwig von Siegen stated the techniques available for producing multiples at the time were engraving, etching and stipple engraving. We must also take into account that Rembrandt was using the dry-point technique. Mezzotint while time consuming was still faster than line engraving. Line engravings could take years to complete and with timely subjects like portraits this is a definite disadvantage. With historical subjects line engraving had a strong appeal to publishers because they could be printed in larger editions and had a wider public appeal. Line engraving could not however match the soft subtle transitions in tonal values that are inherent to mezzotint. Etching could not create the finely graduated gray tones and rich blacks. Dry-point plates are very fragile and the number of good prints that can be taken from them is very limited. The rapid popularity of mezzotint, as often is the case had many reasons. Its commercial appeal was an important factor. It opened broader possibilities for publishers, it gave a superior product that was easily marketable, and it appealed to public tastes. As other techniques developed mezzotint maintained its status as the best reproductive method. Aquatint which Jean Baptiste le Prince is known to have invented in 1768 did not pose a serious threat to the status or industry of mezzotint because of the difficulty in creating smooth tonal changes. It was utilized more as a medium for reproducing sketches and sport scenes and adding color to caricatures and satirical prints. Soft-ground etching and the “crayon manner” were tonal methods used at the time and in the hands of talented people, at times could produce well gradated tones. These two techniques however were best suited for reproducing drawings. Stipple engraving was the most serious threat to mezzotint. Created by building up the density of small dots this method could produce a wide range of tonal values with relative ease. Since these tones could be built up in stages these prints could be mass produced by a number of people working on the same plate. But once again this is an additive manner and is different than mezzotint. In the end stipple engraving cannot produce the very subtlest tones as can mezzotint because by rocking the mezzotint plate one produces burrs as well as holes in the surface so the dots which are more associated with stipple engraving are not so pronounced. Mezzotint survived these technical challenges intact. In fact mezzotint held a solid place in the eighteenth century marketplace. The artistic trends and social tendencies of the time contributed to the popularity of mezzotint. The fashionable large full length portraits of the later part of the century were perfect for the convincing textures mezzotint could provide. Portraits were everywhere. People commissioned portraits for gifts, for publicizing oneself as a politician or artist and mezzotint thus also became a political tool. Painters such as Sir Joshua Reynolds sometimes sent paintings to be engraved in mezzotint before delivery if he thought the subject would be popular. Mezzotint was also a tool to bring news to Europe of the strange discoveries in the Americas and elsewhere during the expansion of the British Empire. Mezzotint was used to illustrate the many new and unique peoples, plants and animals. Old masters paintings were reproduced to an expanding middle class market. Increased leisure time created a demand for prints with subjects idealizing country cottages and a life closer to nature. Sporting scenes were popular. In the late 1700’s mezzotint was the most popular reproductive technique. It was used for everything. It was the best method for producing high quality tonal values and it was sound economically. It was faster than engraving and produced better results. But its reputation relied almost entirely on its reproductive capabilities. As more people used mezzotint for portraits and public announcements more people were exposed to the realistic qualities that could be achieved. This in turn created more demand for mezzotints for book illustrations, reproduction of paintings and political notices. Mezzotint was the method of choice for quality illustration. Why did mezzotint fall into disuse? The first encroachment into the popularity of mezzotint came from an entirely different technical area. Lithography was invented by Aloys Senefelder in 1798. This planographic method had definite economic advantages over mezzotint. The printing was faster. 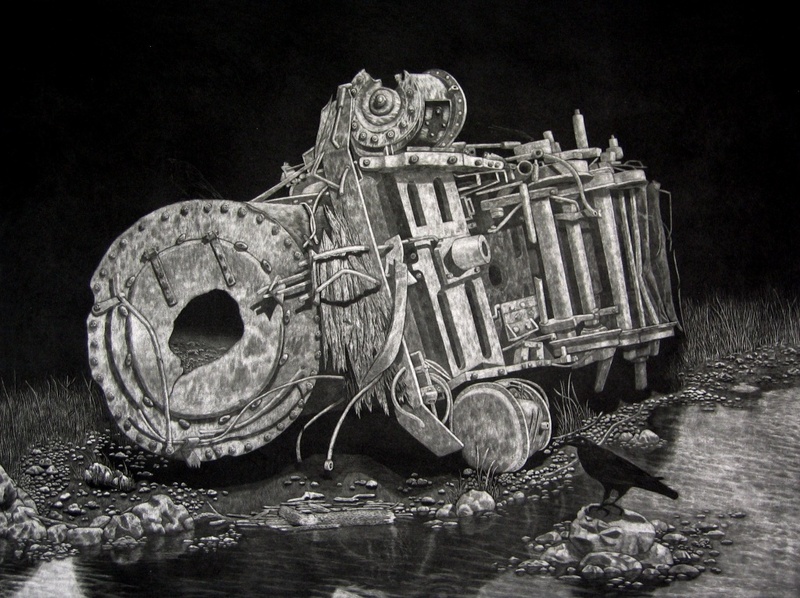 A large (50x70cm) mezzotint could take up to one half hour to make one print. A lithograph approximately the same size only takes a few minutes. The economic advantage is evident. In 1818 zinc lithographic printing plates were developed and the printing was made even easier. 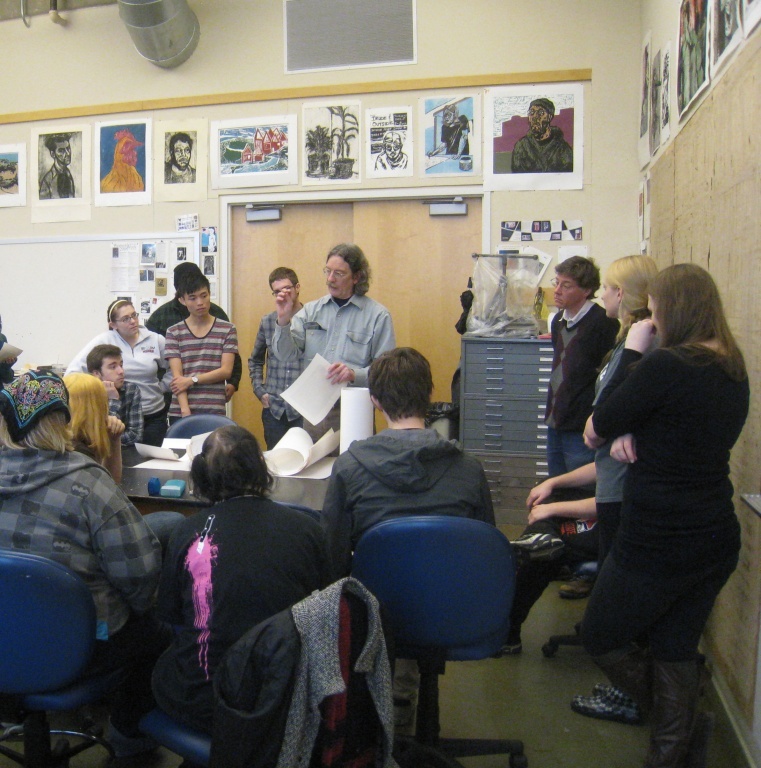 Since printing was faster it was easier to produce complicated multi-color prints with lithography.